Early season Warnings, Watches and Advisories. Pretty straigh forward forecast on tap. Today will be cloudy and chilly with a chance of some drizzle. Temps will be steady or slowly drop. For most of the region, temps will be mid to upper 30's by late evening. Rain and sleet move in from the south after midnight. Temps fall to and then below freezing. Rain will quicly mix with and then change to sleet, and then freezing rain will mix in. By mid morning most areas should be all freezing rain, with rain southside and then end as rain. The western regions will have some snow showers over night Thursday. I expect most schools to be closed tomorrow. Road won't be horrible but they pretty much close for everything. Some places like Lexington and Covington may see 3-4 inches of sleet while Roanoke, Blacksburg and Lynchburg will see closer to an inch. Southside will have a trace and some ice but not a big deal. 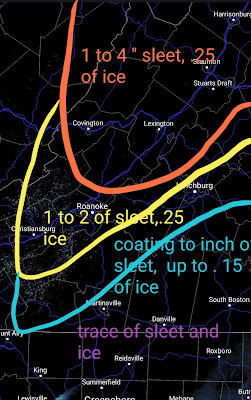 I've attached a map from the NWS to show current watches and advisories and my call on ice/sleet. 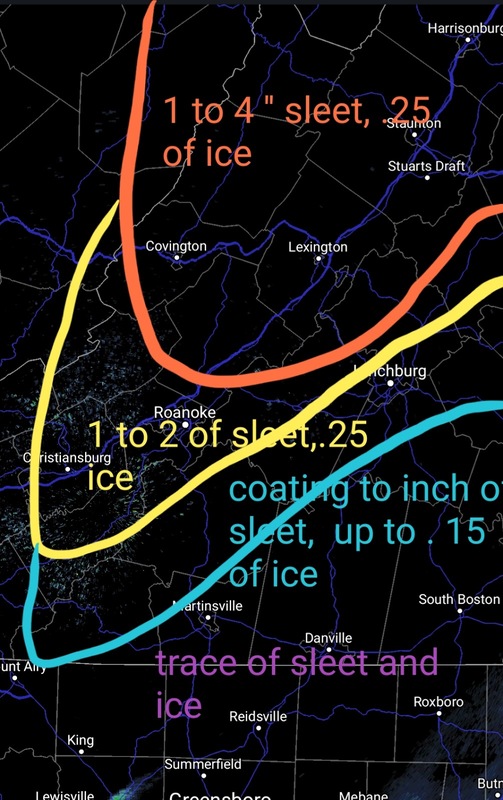 Decent sleet accumulations north and west of Roanoke and Lynchburg. They may never get above freezing some of those regions. Anything south and east of the blue line will see some sleet and freezing rain but only trace amounts. I did way too early outlook here and stated that we could see a rather cold and snowy winter. Because some other factors could change, I left it open ended where changes could be made to my initial thoughts. Short answer is no. We still have a west based modiki El Nino that will likely be weak to moderate. The PDO looks to be positive and the majority of climate models show good jet stream configuration that lends to cold and stormy in our regions. What do the official mets say? What is Normal for our region? I am using long term because there were some data errors in the early 2000 and we also had some less snow winters in the 00-08 winters. In general will be 2-4 degrees below normal for the winter. 125 to 200% of normal snowall. Danville 14-22 inches for the winter . 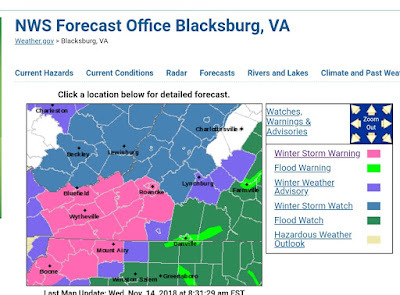 Lynchburg 20-30 inches for the winter. Roanoke 22-32 inches for the winter. Blacksburg 26-40 inches for the winter. These as based on regions-- you should have an idea if your place does better or worse. EG: higher elevations in Roanoke like Bent Mountain do better than the Valley Floor on Orange ave. The last super big winter, 09-10 I was fully convinced we were on the way to a banner winter. There are a few subtle differences that knock my confidence down a couple pegs but still lend credence to a big winter being on tap. 25% chance we come in under my snow totals. 50% chance we end up in that range. 25% we out perform what I predict happens. Right now, these numbers put us just outside a 10 winter for our region. If this pattern develops as maximizes potential, we could end up with a top 5 winter ever. We will actually have a pretty cold pattern starting next week and will last about 2 weeks. There is a decent show we may see our first flakes of the winter. December may favor a chance or window for a snowstorm, like late month between the 20th and New Years Day. I favor the pattern setting up for our "heart of winter" by late January. Late January through mid February should be highest risk for cold and snow. March could go either way but the pattern on many models still look solid for chances for snow. 09-10- Big December snow storm, 2 minor events. January- Big storm late month then active first 2 weeks Febuary. Lynchburg had storms of 12.5, 11.2 and 8 inches. No BIG snow storms but numerous events of 3-6 inches from early December Forward with a near miss where 4 inches of sleet would have been 14 inches of snow in Mid February. Share this outlook with our friends and make sure to follow Virginiawx on facebook and twitter for important updates.